An overview of these towns and their highlights was provided in the earlier chapters. Please revisit those chapters for additional information about each of these towns. Additional information on the towns of Green Istria is available at Istria Tourist Board. Motovun: The famous Motovun is graciously located on an almost 300-meter hill overlooking the Mirna River valley and the mysterious Motovun Forest. Additional highlights of Motovun are listed in Chapter 5. Groznjan: Groznjan is the “town of artists” with abundance of lively galleries and art studios to awaken your inner art spirit. Additional highlights of Groznjan are listed in Chapter 5. Buzet: Buzet is the city of truffles with this highly prized and scarce delicacy growing in nearby forests. Additional highlights of Buzet are listed in Chapter 5. Hum: Hum is claimed to be the smallest town in the world, with less than 30 inhabitants. Hum is also the birthplace of Humska Biska, an ancient liqueur made with mistletoe. While there, have an Istrian meal in the local tavern. Hint: there’s only one! 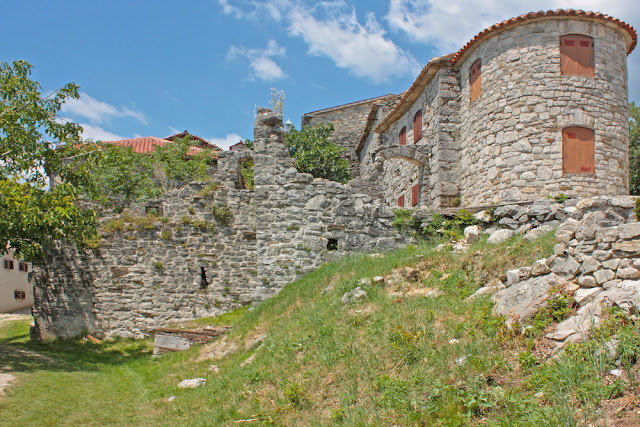 Pazin: Pazin is the administrative center of Istria, located in middle of the peninsula. Additional highlights of Pazin are listed in Chapter 5. Labin: Sitting on the 300-meter hill is the best preserved acropolis settlement in Istria. Additional highlights of Labin are listed in Chapter 10.